Capcom's fighting game brings big changes to the series. An instantly likeable game hiding a brutal edge that demands mastery. Balance is concerning, but partially mitigated by an extensive roster. What is it? Capcom’s latest cross-over brawler that pits Marvel’s finest against their own roster of heroes and villains. At first glance you can boil Marvel Vs Capcom Infinite down to one question: do you want to see erstwhile Dead Rising photojournalist Frank West throw a shopping trolley at Thanos? Frank is a man with a camera, a penchant for slapstick comedy and a fighting style that relies on picking up random bits of tat to assault his foe. Thanos is about two steps away from being an actual god, with a list of powers that would probably take up half of this review if I listed them. The MvC series gives you an excuse to engineer unlikely team-ups and make hilariously out of their depth characters face off against people they have no business fighting. It might look like a novelty exercise, but these games are beloved brawlers, colourful, spectacular and with a combat system that amounts to barely controlled chaos. Characters tag in and out of fights in the middle of the action to chain combos and toss around one-liners. Infinite's roster is 30 characters strong and runs the gamut from bruisers like Hulk and Mike Haggar to agile speed merchants like Gamora and tiny little men-with-lances like Ghosts ‘n Goblins protagonist Arthur. It’s a great roster that introduces welcome additions like Captain Marvel and Darkstalkers’ Jedah Domah (although some will bemoan the absence of more eclectic choices from UMvC3, like Phoenix Wright). Infinite is Capcom's attempt to make the series more accessible. That means no partner moves from offscreen this time (with the exception of some Groot cameos for Rocket Raccoon). One-button combos are back and you can execute hyper combos with a double button press. If you go into the game with no prior knowledge of the series, it doesn’t take long to get into the groove. Infinite is a button masher’s dream, with simple combos that chain in and out of each other in a pleasingly freeform fashion. Infinite is a button masher’s dream with simple combos that chain in and out of each other in a pleasingly freeform fashion. The easily executed hyper combos give newcomers a spectacular way to use their meter, though specials and normal hyper combos are easy to execute anyway. The skill lies in using your partner well, whether you're tagging them into combos, or upsetting the flow of a fight—if your Iron Man is getting second-guessed at every turn, bring out Dante and mix things up with a different combat style. Infinity stones, applied before each match, add further depth by adding unique attacks and effects along with a mode you can trigger with a full meter. Some let you play a safety game, like the soul stone, which leeches back health and revives a dead ally, allowing both of your characters to fight at once. Others allow you to close gaps, or control your opponent’s movement. Playing online exacerbates some of the series’ long-term issues with restraint. While the Infinity Stones prove their worth in terms of allowing you to be flexible in the way you approach each match, they also contribute towards the games’ busy visuals. In a game where failing to block a single attack can turn into an extended bar-busting combo, a lack of visual clarity is a problem. A lack of balance is quickly demonstrated when played online, with Captain Marvel dominating play thanks to a particularly suffocating playstyle, while the likes of Chris Redfield and Frank West feel a little limp and useless against strong players. 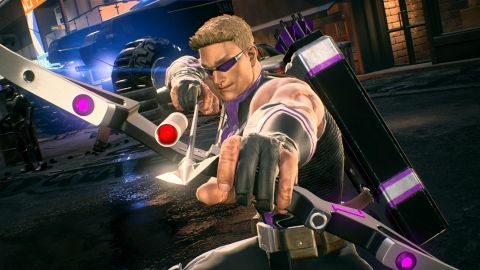 With a heavy focus on upcoming DLC that will see the likes of Black Panther and Sigma joining the fray, it’s a genuine concern whether Capcom will be able to fix these issues in the short-term. There are still enough strong characters that most players will find a duo to delight in, but not all heroes are born equal. The other headline addition to Infinite is the series’ first cinematic story mode. The actual story is bunk as you may expect, a thin ‘two universes collide’ excuse to get these characters together. It’s generic stuff, executed with just about the right amount of bombast and momentum to carry it through. The story does fan-service well. Almost every character on the roster gets their moment to shine and there are fine team-ups: Ryu and the Hulk are apparently best buddies in this combined universe, while Spider-man and Frank West make for an engagingly goofy team (Chris Redfield is still a total bore, though). The flip-side is that the actual fights in the story-mode can be uninspiring, overusing non-roster clone characters that present no serious challenge. Despite that, if you like any of these characters, there’s a whole lot to enjoy in this genuinely funny campaign. Marvel Vs. Capcom: Infinite is superficially a highly entertaining pick up and play brawler, one where you can go from picking up a pad to performing visually spectacular combos in mere moments. Delving deeper and heading online demonstrates that the game can be unforgiving. Learning to comprehend complex visual cues offers either a long-term challenge or a significant barrier to progress depending on your outlook.